Louis VII‘s son, Philip Auguste, was much more ambitious and smarter than his father. 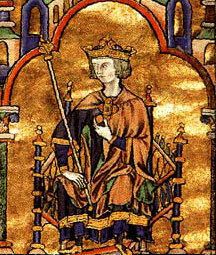 Philip came to the throne in 1180 AD, when he was only fourteen years old. Philip began well by marrying a woman who brought a rich part of medieval France called Artois as her dowry, so he had more power and more money than his father had. Then Philip encouraged Richard and John of England to fight against their father, Henry, so as to weaken England’s hold on French territory in Normandy and Aquitaine. Philip went on the Third Crusade, in 1188 AD (when he was 22), but came home early to continue pushing the English out of France. Richard’s early death made this much easier, because John was not a good soldier. What was the Third Crusade about? After Frederick Barbarossa drowned in 1190, Germany fell into civil war, which also helped Philip get more power. 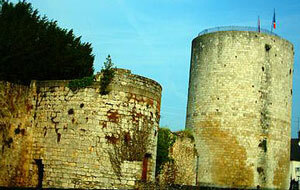 In 1212, he sent an army into the south of France on the Albigensian Crusade, killing tens of thousands of Cathars. By the time Philip died in 1223, at the age of 61, he had created a loyal civil service which administered and oversaw every province of his kingdom, all over France. Philippe’s son Louis VIII took over when Philip died, and continued the Albigensian crusade. When he won, in 1226, Louis VIII forced Count Raymond of Toulouse to marry his daughter to one of Louis’ sons, so that the French kings took over the direct rule of Toulouse (because Raymond had no sons, his daughter inherited his property). But Louis died later that same year. Because Louis VIII died young, in 1226, his son, Louis IX, was only twelve years old. 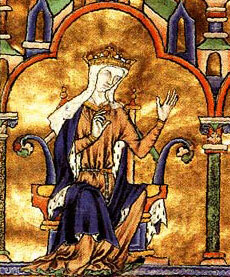 Louis IX’s mother, Blanche of Castile (Eleanor of Aquitaine‘s granddaughter), ruled for him until he grew up. Blanche was a good ruler. Many people in France didn’t like her, because she was originally from Spain. Some lords thought this was a good chance to rebel and get back their independence. But it was too late. The king‘s armies were too strong for them, and the lords were not united enough to overcome him. Louis IX convinced pretty much everyone in France that it was always better to follow the king. He was so religious that he became a saint after he died, and today we usually call him Saint Louis. Because Louis was so Christian, he wanted to hurt French people who were Jewish, but his mother protected the Jewish people. Then Louis decided to go on the Seventh Crusade. Blanche thought this was a bad idea, and it was. Louis’ army was destroyed. Blanche ruled France for Louis while he was away, but then she died, and he had to come home. He came home with what he thought was Jesus’ original crown of thorns, and he built the Sainte Chapelle to keep it in. What was the Seventh Crusade about? What does the Sainte Chapelle look like? Not long afterwards, Louis went on the Eighth Crusade. He died in Tunis on the Eighth Crusade in 1270, probably of dysentery. Both Crusades were failures. Who was ruling Tunis at this time? St. Louis’ descendants were not as well loved as he and Blanche were. They put in more and more taxes, and were not as concerned with justice. The beginning of the Little Ice Age was making it harder for farmers to grow good crops. But the French people still wanted to follow their kings, Louis’s son Philip III (1270-1285) and his grandson Philip IV (1285-1314). 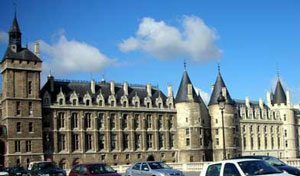 Philip IV finally replaced the old Roman fort in Paris and built the Conciergerie. The lords never united against the king as they did in England. And if they could not unite the alternative to the kings was civil war, which nobody wanted. 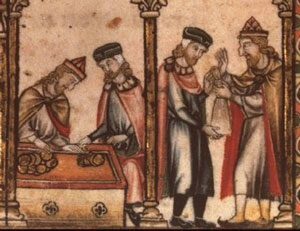 In 1290, when Edward made all the Jews leave England, many of them settled in France, still protected by Blanche of Castile’s old policies. But the next year, in 1291, Philip IV – not so concerned with justice – threw the Jews out, too. Philip IV had three sons, Louis X (1314-1316), Philip V (1316-1322), and Charles IV (1322-1328), but they all died young without leaving sons of their own. All three men had daughters, but – even though Blanche had done such a good job – the French lords refused to accept a woman as their official ruler, or even the sons of these women, Philip IV’s grandsons through their mothers. Instead, they chose one of Charles’ cousins, Philip of Valois, to be the next king. He was a grandson of Philippe IV, but through his father. The king of England, Edward III, was also a grandson of Philip IV through his father, and he said he had as much right to the throne as Philip of Valois did. When Edward attacked France to enforce his right to the throne, the Hundred Years’ War began. Need a second source? Check out this short biography of Blanche of Castile. Cite this page: Carr, K.E. Philip Augustus and Blanche of Castile. Quatr.us Study Guides, August 3, 2017. Web. April 26, 2019.